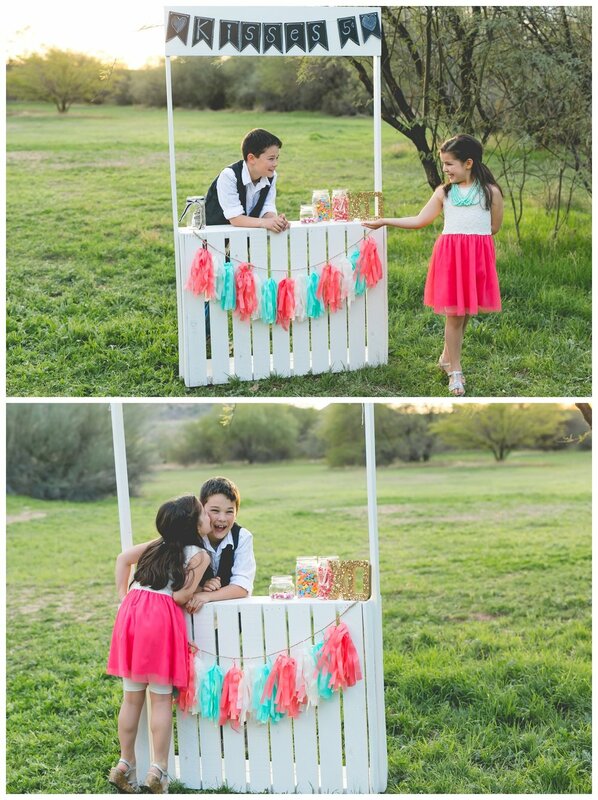 Super Cute Valentine's Day Kissing Booth Mini Session in North Phoenix! Whelp, it's ALREADY Valentine's Day 2017 and we're over here like, where in the blazes did January go?! Despite the fact that time seems to be speeding up and our three beautiful kids won't stop growing, we took Valentine's Day minis to a whole new level this year! We have such amazing, handy friends (*cough You're the best Jo! 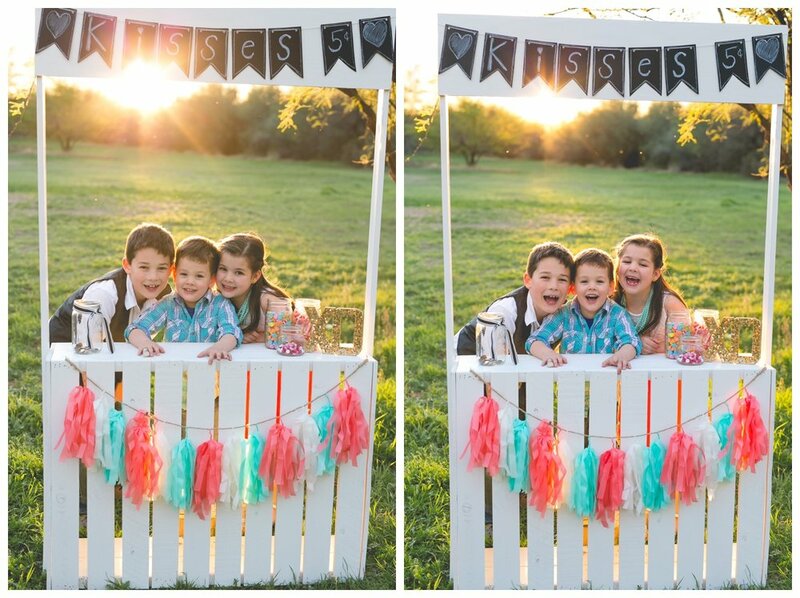 *cough*) who built us this super cute kissing booth just for this fun little occasion! We rounded up the kids, blew threw homework (we might have given them a few answers to speed up the process), and rushed over to one of our favorite local spots before the light faded! And holy sweet, golden sun are we GLAD we did! It almost didn't happen! The struggle was REAL to get these school-dazed kids out the door before that sunset. But we made it by the skin of our sugar coated teeth! 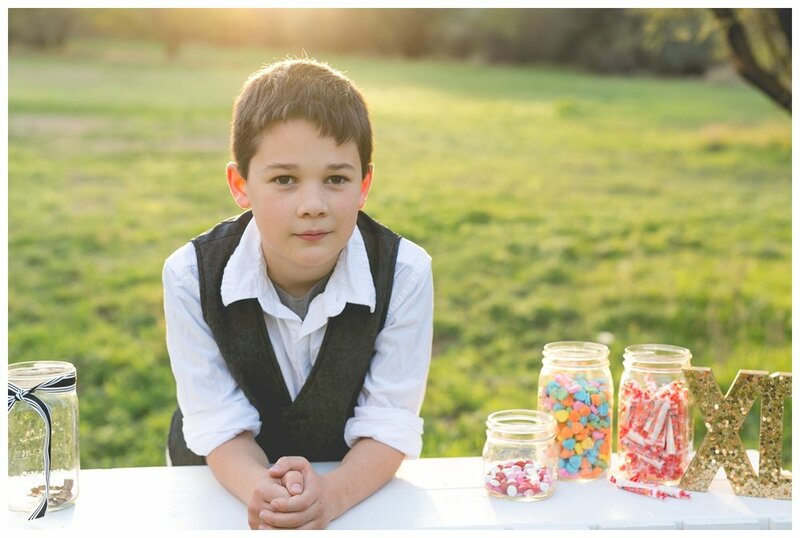 Everyone pitched in to make this one of our most memorable and fun mini sessions yet. Our oldest was such a great helper. He took charge and had so much fun role-playing and getting the two little ones to play along! The other two took the bait and were hooked. 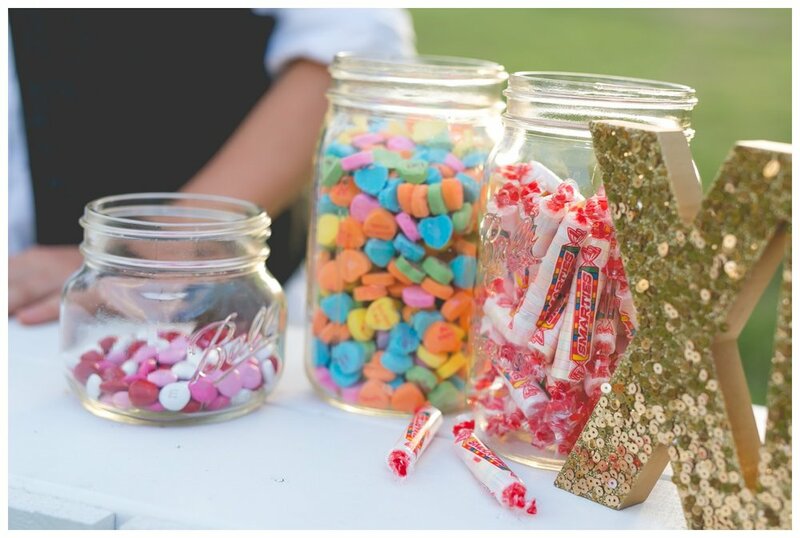 It also helped that we had jars of candy lying around everywhere. 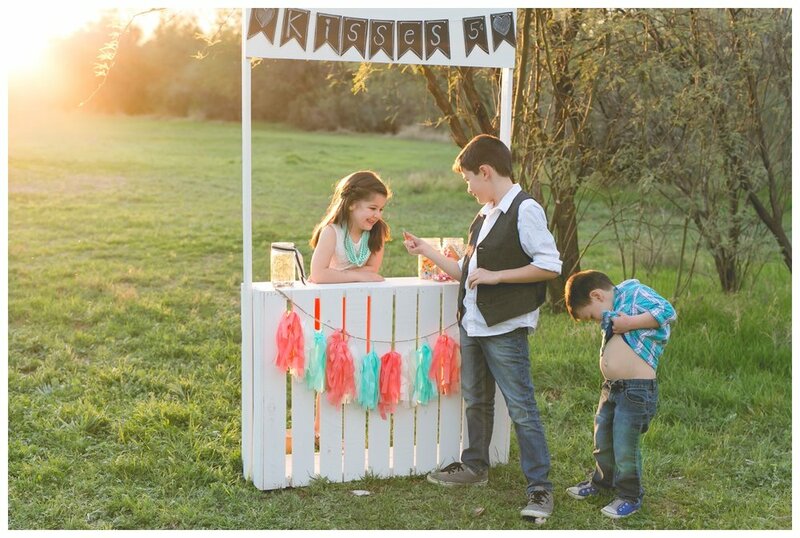 Our daughter is a woman after her mother's heart and couldn't keep her hands out of the candy jars though! And our poor youngest forgot all his money at home. 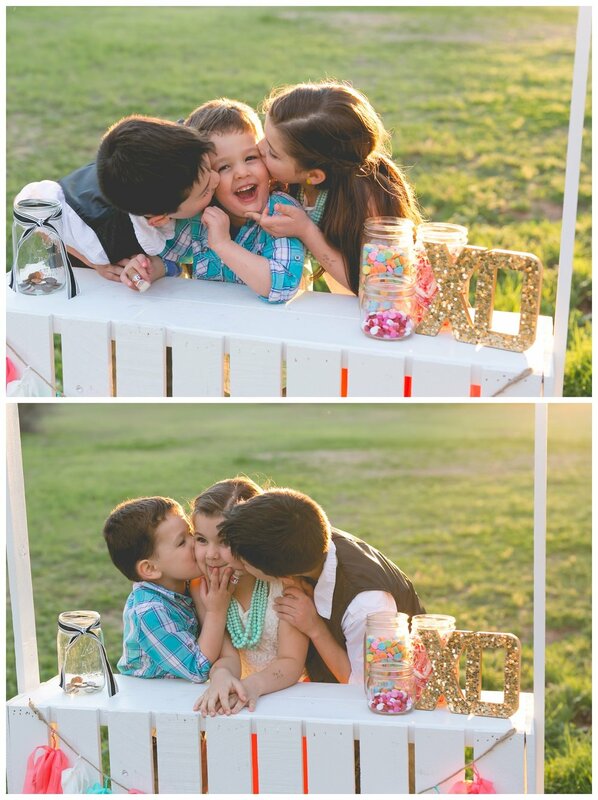 Thankfully, his older brother and sister were willing to sneak a few chubby cheek kisses, free of charge! We hope you have as much fun this Valentine's Day as we did doing this photo shoot. Find someone you love, hold them close, and don't be afraid to give out a few kisses free of charge too! Happy Valentine's Day lovebirds! Fri-yay is back like Marty and Doc, y'all! 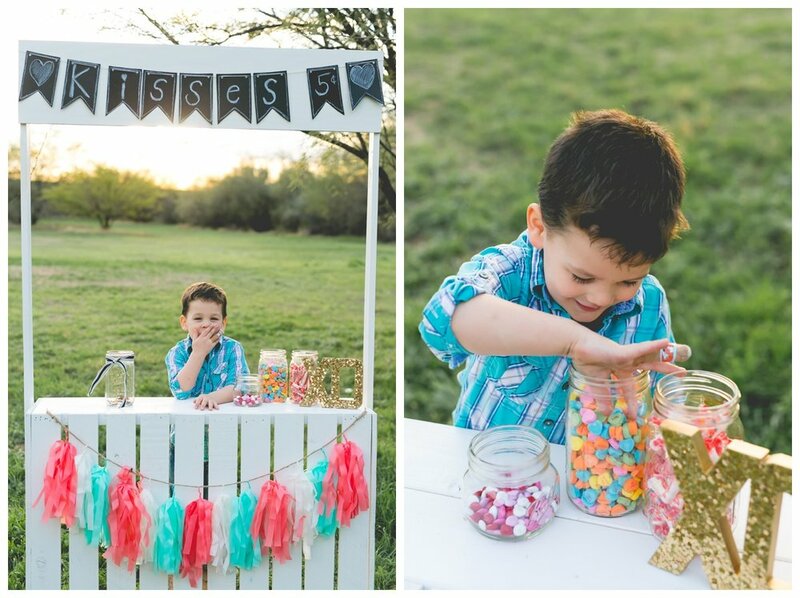 We've had a fun-filled week of costume parties, sugar comas, and hooking up our clients with some awesome photo swag! So read on...if you dare...(sorry, still in Halloween mode). 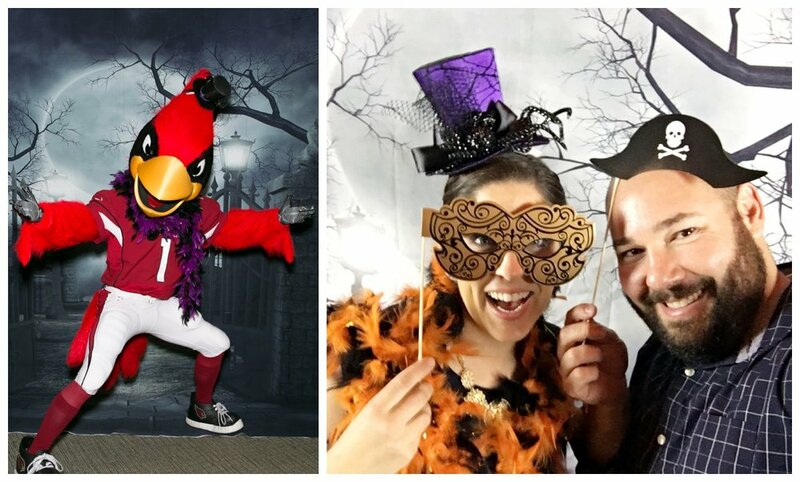 We had so much fun shooting a corporate Halloween party this past Friday night at University of Phoenix stadium! Sadly, despite us now being a full-fledged Cardinals family, we'd never been to the stadium before. We had the privilege of getting a tour of the facility and hanging out with Big Red for a couple hours. It was so cool to see the press box, visiting locker room, and all the other behind the scenes stuff. All in all, it was a great time to hang out and any time we get to work side by side, it's really one of our favorite parts of our job! The kids dressed up for Halloween in a "unique" assortment of characters this year. Themes went out the window as each kid decided on their own costume by themselves and, like we said last week, our give a care about Halloween was broken! Cowgirl?! Yes ma'am! Super Mario?! Fine by us! Bumblebee? Right on! The kids had a blast and so did we. If you missed our Halloween recap, check it out from earlier this week. Finally, we were so pleased to present our clients with some truly beautiful photo albums and framed prints this week! These professionally printed photo albums really are a thing to behold. We know that most of you out there are busy with work, school, activities, and life in general. That's why we absolutely LOVE coming alongside our clients to take away some of their burden by helping them celebrate their family through photographic art. 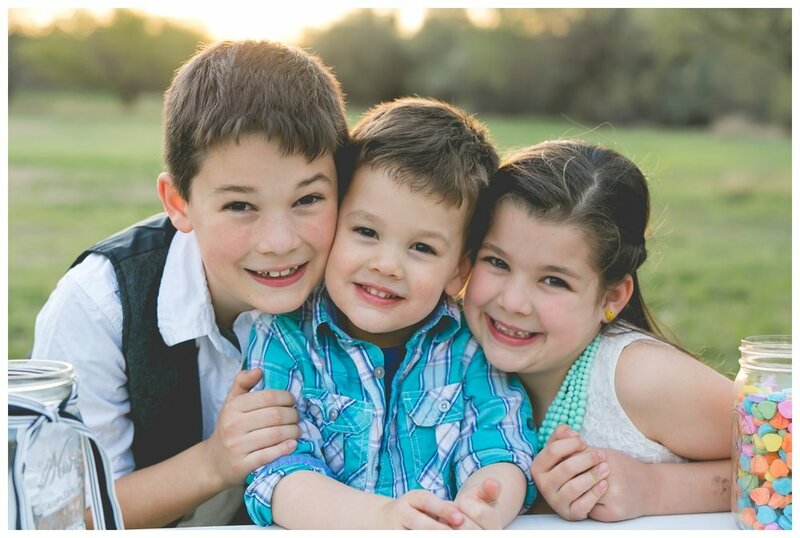 We find so much joy in being able to work with families to leave their legacy for the next generation by creating quality photographic art that will truly last a lifetime. 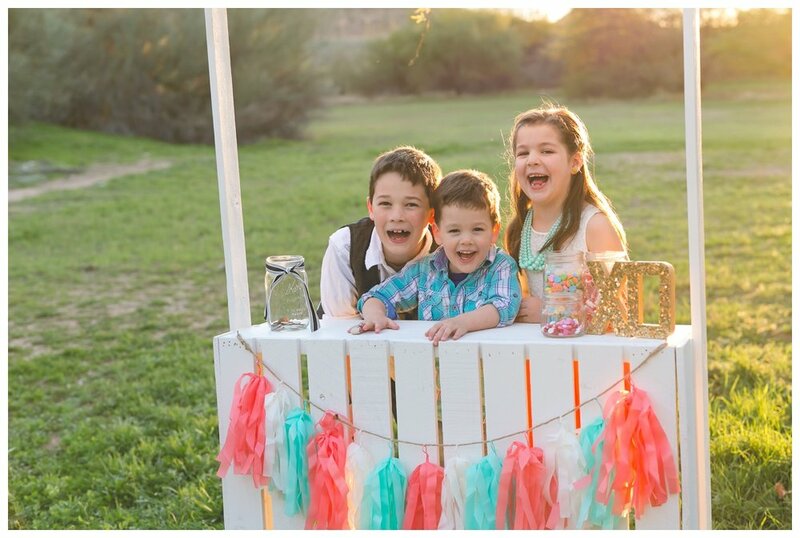 If you are one of the busy ones that can never find the time to take photos, print photos, hang photos, or even think about photos, go ahead and tap that contact us link...we really do love helping and would love to help you too! Have a safe and happy weekend everyone! We'll catch you all next week! Well we survived another year of an insane amount of energy, and a sugar rush that would put Willy Wonka to shame...all in the name of free candy and memories. 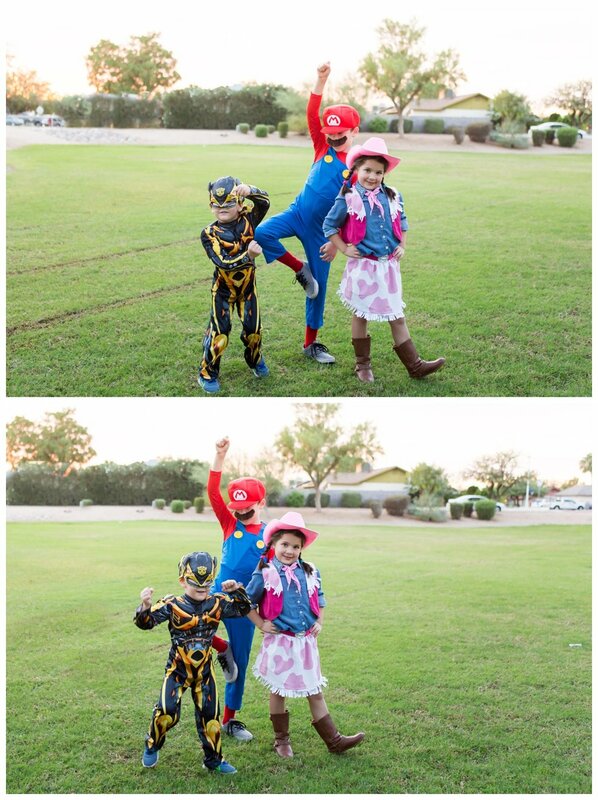 This year we had Super Mario, a Cowgirl, and Bumblebee the Transformer! Eli wins for funniest costume (which was a tad too small, #momfail...we just can't seem to get him to stop growing! ), Olivia wins for cheapest and cutest (naturally), and Titus wins for being the coolest (he loved those muscles, if you can't tell). We took the kids over to their friends' house and enjoyed walking around with a dinosaur (T-Rex more specifically...we asked), Luke Skywalker (from episode 4...according to Eli this was an important disctinction), a Pirate Fairy, a police man and Spider man. Even some of the adults jumped in, with an appearance from Rey from Star Wars, and ANOTHER Luke Skywalker (albeit from episode 6), and even a little BB-8! We were quite the crew and had so much fun! We got to relive our own memories of walking around neighborhoods, clutching pillow cases, and getting way too much candy! There were so many people out and about it really was a fantastic time, and we drove away thinking "Now that's what Halloween is SUPPOSED to be like!" We got to hang out with good friends, family, and a bunch of other weirdos in costumes just for fun! The only bad part of the night was getting locked out and someone (who will remain nameless) had to show off their Crossfit skills and bust down a door. Never fear though, that same individual also has some crazy good handy man skills and fixed the door in less than an hour. We hope everyone else had a fantastically fun and safe Halloween like we did! We also decided that, because we had so much fun this year, we might just have to dress up ourselves next year! If you have any suggestions, let us know!